Italian ryegrass is a vigorous biennial grass that is most often managed as an annual crop when used as a cover, companion, or forage crop in northern climates. The forage quality and yield potential are extraordinary when appropriate cultivars are selected and intensively managed. For rapid and consistent establishment, ryegrass seeds should be planted 0.25 inch deep. For companion crop applications with perennial pasture and hay crop seedings, ryegrass should be seeded at no more than 2-4 pounds per acre. Higher rates may out-compete the perennial grasses and legumes. While winter survival is possible if temperatures are moderate and/or snow-cover is adequate, Italian ryegrass should be managed as a spring annual. For haylage production, ryegrass should be seeded early in the spring at of 25-40 pounds per acre. Annual and Italian ryegrass have recently received more attention from farmers, university researchers, and the agricultural industry. Primary uses for this crop include: annual haylage crop, companion crop for new seedings of perennial forages (i.e., instead of oats), cover cropping, pasture enhancement, and erosion control. Under good management, ryegrass forage yield and quality are typically very impressive. Like most tools, if used properly it can be very profitable; if used improperly, this species can cause economic damage. Because of the similarities and between these grasses, the term ‘ryegrass’ will be used for in the remainder of this document unless important functional distinctions are being made. is an important distinction: ‘annual ryegrass’ plants will try to produce a seedhead in the year that they are established; ‘Italian ryegrass’ seedlings need to go through a period of cold weather after establishment in order to initiate the process of seedhead development. This distinction seems to be a common point of confusion, so before you purchase ryegrass seed, be sure to verify with the vendor that it is a type that you want. Also, it is not uncommon for a field planted with Italian ryegrass to produce some (but very few) seedheads even though it should produce no seedheads at all. This could be due to genetic contamination in seed production areas (grasses are open-pollinators), seed contamination, or a stress response in localized areas within a field. Perennial ryegrass winterhardiness can be extremely low or very good, depending on variety. While there can be exceptions to the rule, Italian and annual ryegrasses should not be expected to survive the winter in northern-tier states. Finally, it is important to understand that ryegrass is not the same as ‘cereal rye’ (aka winter rye, fall rye), which many dairy and vegetable producers already use as a cover crop. Native to southern Europe, annual/Italian ryegrasses have been used in various ways in parts of North America since early Colonial times. These grasses are well-adapted to cool climates with abundant rainfall. The leaves of annual/Italian ryegrass are glossy and generally wider than perennial ryegrass. Close inspection reveals that Italian ryegrass has clasping auricles (tiny appendages originating at the leaf collar that each come part way around the stem); and awns (tiny spikes) on the seeds. Perennial ryegrass has neither of these characteristics. 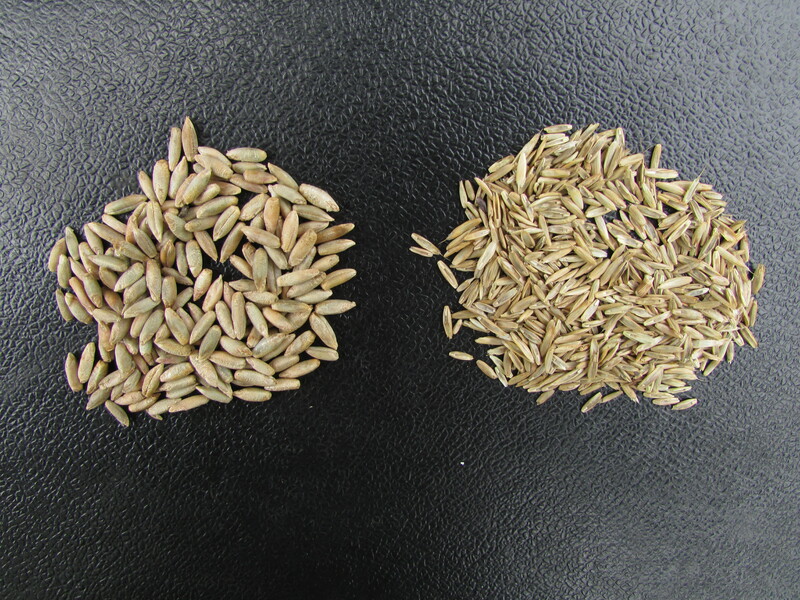 Italian and perennial ryegrasses are genetically similar enough that they can cross-pollinate, resulting in progeny called intermediate ryegrass. Ryegrasses have a dense, fibrous root system and generally grows well in to soils ranging from high sand content to heavy clay and grows optimally when the soil pH is above 5.7; it will become dormant during times of drought. The long history of ryegrass in grassland agriculture is due to high seedling vigor, rapid establishment, nutrient responsiveness, excellent forage quality, and adaptation to a variety of soil conditions. Due to their ability to produce high yields of high-quality forage at a comparatively low cost, ryegrasses are a major component of dairy cropping systems in Great Britain, parts of continental Europe, New Zealand, and the temperate region of Australia. They are increasingly being used on U.S. dairies. highly palatable component of wildlife food plots. Ryegrasses are also used for enhancing older stands of alfalfa, filling in gaps in a damaged grass stand, planting it in ‘sacrifice’ areas, and as a perennial (via self-reseeding) crop. Researchers in Wisconsin have demonstrated that under ideal management and conditions, Italian ryegrass can yield as much as 9 tons of high-quality forage dry matter per year. Potato farmers in Northern Maine are increasingly using true Italian ryegrass (no seedheads in the first year) in their potato-barley rotations. While Italian ryegrass is not well suited as a cover crop to be planted after corn silage, other cover crop applications do exist (see Italian Ryegrass as a Companion Crop and Cover Crop). Its ability to establish rapidly and its dense, fibrous rooting system makes ryegrass useful for reducing soil erosion, reducing soil nitrate loss, and has led to an increase in its use as a cover crop in row-crop agriculture is increasing in parts of the country with more mild winter temperatures. This does not mean that Italian ryegrass is well suited as a cover crop to follow corn silage in most of the Northeastern U.S., because it is not. Like cereal rye (aka fall rye or winter rye), Italian ryegrass requires vernalization (exposure to cold weather) to initiate the reproductive stage of growth. Unlike cereal rye, many/most varieties of Italian ryegrass winterkills or have highly variable survival within and among fields. For more information, see Italian Ryegrass as Companion Crop and Cover Crop and Italian Ryegrass as a Forage Crop. This entry was posted in Uncategorized and tagged annual ryegrass, cereal rye, companion crop, fall rye, forage, grazing, intermediate ryegrass, Italian ryegrass, nitrogen, nitrogen fertilizer, northern, nurse crop, perennial ryegrass, University of Vermont, University of Vermont Extension, weed management, weeds, winter rye, yield. Bookmark the permalink.